Listen to an interview on KDKA NewsRadio 1020 — see a Pittsburgh Post-Gazette feature. Visitors to the Heritage Museum this year will be treated to a visual feast of model railroads in a variety of platform layouts in two rooms, including a new Pittsburgh Steelers train setup. This is a must see for kids and kids at heart! The swirling black and gold Steelers layout includes four engines, 38 cars, and a Steelers branded health club, restaurant and stadium. The exhibit is decorated with six Terrible Towels plus a Steelers scoreboard, player statues, bus depot and mascot Steely McBeam, courtesy of collector Charlene Murray. Most of the other model trains in the museum’s exhibit — installed by curator Bob Frederick — are post-war vintage, meaning they were manufactured after World War II. They are categorized by the width of their track, or their gauge. Two gauges are on display: the O gauge, having three rails, and the S gauge, manufactured by A.C. Gilbert, having two rails. Upon entering, guests will see familiar elements on the right train platform. Trains encircle a model of Beaver’s Pittsburgh & Lake Erie freight station, crafted by museum volunteer Robert Smith. On the outermost track, catch a glimpse of Marilyn Monroe as she gazes out the back window of her passenger car. According to some accounts, young “Norma Jean Baker” (as she was then known) rode the New Jersey Central Railroad to and from a private school. On the innermost track with the bridges runs a Lionel O27 gauge train. The platform on the far end of the main display has both local and international features. On the inner track on right side of the platform is an O gauge tin train manufactured in the Czech Republic around 2010. The P&LE train running on the platform’s main track is a model of the trains that hauled more freight to and from the area’s steel mills than any of the other local railroads during World War II. Guards were stationed on the P&LE Bridge to prevent sabotage. Also on the far platform, not on track, are antique train cars manufactured by Ives in the 1920s. The platform in the gift shop features an O gauge Coca-Cola train and a diorama that will change with the seasons. On display throughout the Museum are several other treasures, including three model Pullman passenger coaches from the late 30’s to early 40’s, a hobo’s railroad spike whistle machined by a “retired hobo” on antique machinery, some vintage local railroad pictures, literature, tickets, old four-sided railroad lanterns and other railroad memorabilia. Model Railroad Background – People began making models of railroad cars shortly after creation of the real things in the mid-18th century. The first complete train “system”, however, was not available until 1891, when Märklin, a German company, introduced a series of standard track gauges, track sections, locomotives, rolling stock, and matching accessories. By 1900, Märklin was producing four different gauges. In the past 100 years, that number has mushroomed. Today, the most popular scales include #1 (1:29), O (1:48), S (1:64), HO (1:87), and N (1:160). In 1972, Märklin introduced what is still the smallest model railroad scale, Z (1:220). For example: the 2004 Märklin Snow Plow Train has four cars and measures 8 11/16 inches long. Beaver Rotary Club to Serve as Volunteer Greeters – For the third straight year, as part of its enduring commitment to furnishing community service, members of the Rotary Club of Beaver will serve as volunteer greeters four times during the exhibit season. About Curator Bob Frederick – is a lifelong model railroader. As a young boy growing up in his Marion Hill home in New Brighton, he remembers saving paper route money to buy engines, track and cars from Bestwick Hardware on the main street. 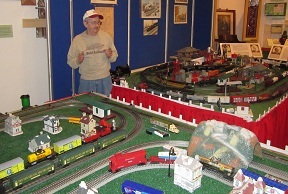 “I have always been fascinated with train sets,” he claims, now with more than 60 years of collecting. He recalls every Thanksgiving after dinner he and his father would empty the dining room of everything but the carpet and the curtains – the table, chairs, buffet and china closet all went to the third floor with the blessing of his mother, also a train enthusiast who accompanied Bob to train shows well into her elder years. He and his father would fill the living room with a train platform that stayed up through Easter! Hours – Saturdays 10 a.m. to 4 p.m., and Sundays 1 p.m. to 4 p.m.
Corporate Sponsors – Strassburger, McKenna, Gutnick & Gefsky (Gold) – Williams Companies (Silver) – Eaton Corporation (Bronze). Bring your kids and grandkids to visit the museum to be fascinated by this exhibit!